Jenny will lead the evening. She will show us how to turn a polystyrene ball into a bright and shiny Christmas tree decoration. All the materials required will be supplied. At the end of the evening the baubles will be kept and used on our Christmas tree in the church. We will return them in December. The rise of Arkwright’s spinning technology and the impact on family life Chris Lea, Arkwright Society. Having visited a mill and looked at spinning and weaving machines, now is the chance to find out the huge impact these great factories had on the women who worked in them and their families. Not only the people who worked in these mills, but the many that sewed for a living as cheap and reliable thread became available. Travel Inspired Stitch Laura Marriott. Laura will be talking about how her travels influence her initial inspiration. She then goes on to grow the designs to be completely unique in all stages of the process from drawing to embroidery. She likes to push the technical side of the design to ensure her creations are original and different from anything that is being made by other artists. Crafting the Digital Sally Cooke. Expert stitches from the past and the present. We have booked two folios of work from the Embroiderers’ Guild collection. One is “Historical - British work from the eighteenth century” and the other is ‘Edges’. During the evening we will be able to study these two very different folios in detail. You are welcome to take photographs. sketch and make notes help fix an idea for use later. This is a big celebration of the work we do. 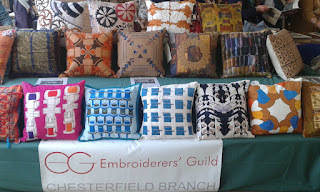 There are two group projects, digitally printed cushions and room boxes. Members will also display their own work based on the big cotton mills of the Derwent Valley. Venue: West Studios, Sheffield Road, Chesterfield S41 7LL. Connecting with nature. Helen Hallows. Helen will talk about her creative journey and then give us a demonstration of her techniques. This will be followed by a question and answer session. There will be lots to look at and talk about. Painting with the needle of a sewing machine. Margaret Fairhead. Margaret has had a long, varied and successful career in textiles. She will show many pieces of her work which indicate the progress made from very early days in dressmaking, teaching to ‘O’ level, then moving to purely creative pieces. This will include acknowledgement of the people and organisations that have helped her on her journey. Hilary works with the small stitches that women have always used to mend clothes. With these she creates lovely tiny pictures and patterns. The workshop is suitable for all levels of ability. We started to take bookings and payment at the April monthly meeting. If there are spaces left bookings can be made at the May meeting. The cost for the day is £35 which covers tuition and unlimited (almost) tea, coffee and biscuits. For those who have not been to a workshop before: the workshop will be held at the Friends Meeting House on Ashgate Road. There is limited parking but there is a public car park over the road. The doors open at 9.30am. This allows you to get organised before the workshop starts at 10.am. The workshop ends at 4.00pm. We must be clear of the building by 4.30pm. When you book your place you will receive a list of requirements, etc. You need to provide your own lunch. Members Only Outing - Come into the Garden. Welcome to the garden and studio of one of our members. Members are invited to spend the evening visiting this lively studio and enjoying the beautiful garden and its views. The evening will also see the return of the travelling books. Treasure Trove of Textile Books: Looking between the covers of my favourite books. Gwenda Culkin. I have collected textile and art books since being a child. Some have come and some have gone, but others I cannot part with. I will share with you a miscellany of my favourite books, old and new. I will enhance these with a few relevant artefacts. Annual General Meeting. Time to reflect on the past year and share ideas for the future.